Practical Magic for Writers Drawing! for a FREE 13-week workshop! 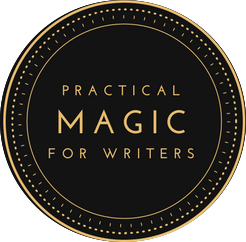 During its 13 weeks, this course teaches you the magical anatomy of creative genius as it operates both in you and in your writing. Each unit will develop within you a different aspect of your relationship with your own creative genius, and you will be writing regularly in a way that feels purposeful and good! On alternate Thursdays you will receive either a lesson by email or a LIVE webinar (10 am Pacific/1 pm Eastern) that supports the lesson and answers your questions. If you cannot attend the live broadcast, you can get your answers during the replay. Fill in the form below to enter the drawing for a free workshop! You can change your mind at any time by clicking the unsubscribe link in the footer of any email you receive from us, or by contacting us at marya@whollycreative.com. We will treat your information with respect. For more information about our privacy practices please visit our website. By clicking below, you agree that we may process your information in accordance with these terms.